A new program to train trans* community members who have an interest in becoming a peer or may have some peer support skills already to become Super Trans Peers. A Super Trans Peer will have attended the workshops, be accredited by the community, be available for befriending and peer support for trans* community, and actively supporting and sharing skills with the community. This project is important because coming out can be a very isolating and a potentially traumatic time for many trans* people. The trans* community have very high rates of suicide and depression, making it important and a huge source of support to be given the opportunity to connect with others who understand and are going through a similar journey. 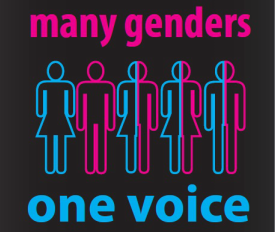 From June the 17th on International Day Against Homophobia and Transphobia, Many Genders, One Voice (MGOV) will host a series of 5 training workshops at 30 Helen st Tenneriffe from 1-4pm. Workshop topics include; setting boundaries, suicide prevention, counselling, Anti Discrimination and self defence. The program will also include practical experience with the option of visiting ATSAQ.This program is run in partnership Mind OUT, Wesley Mission, ATSAQ, and the Anti Discrimination Commission QLD. It’s been a month since Get Bucked Australia wrapped up and we wanted to recap some of the highlights. This project also made Australian history as we had the very first official trans men for men cruising nights at Sircuit and Signal. The venues worked really hard to create safe, fun and inclusive spaces for all the men to play. This goes a long way towards acceptance and community education. Our ROUGH & SWEATY parties were so much fun and showcased the amazing local gender diverse and trans artists, DJ’s and performers. We proudly raised money for several organisations. With Vic Leather we raised $500 for Zoe Belle Gender Centre. Our SAFE & STRONG workshops raised $630 for the Indigenous advocacy and support group Sisters & Brothers NT. We also raised $230 for Many Genders One Voice, the action group in Brisbane. With the support of the Victorian Aids Council / Gay Men’s Health Centre, we will soon be releasing a public service announcement about trans men and their sexual health and well being, featuring Buck Angel and Jez Pez. Many connections were made and many more conversations were had and we wish to thank everyone who participated, contributed and supported the success of this project. "Transgender Day of Remembrance is a day where we honour the memory of transgender people who have passed. This year we will be doing a balloon release (with biodegradable balloons and string). You are invited to write a special message on a balloon and release it to commemorate those who are no longer with us. We will meet at Healthy Communities at 11am, where we will have some short speeches ... "